CTiH grew out of a fraternal group of the clergy of Hampstead Parish Church, Heath Street Baptist Church, St Andrews United Reformed Church, St Mary's R.C. Church in Holly Place, Christ Church and a representative of the Quakers in Heath Street. The Hampstead Counselling Service, still flourishing today, grew out of those first meetings. 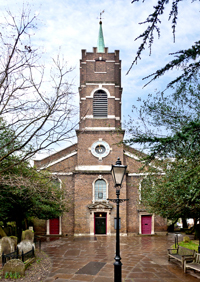 Later CTiH extended its boundaries to include the Unitarians in Rosslyn Hill and the Royal Free Hospital Chaplaincy, and more recently Emmanuel, West Hampstead, St Peter's, Belsize Park and St Saviour's, Eton Road have joined us. Other local churches, such as St Thomas More, like to be kept informed of our activities. From the beginning the original member groups came together each year to share Lent Groups, something we still try to do. Between the churches we try to run a house or church Lent group on weekday evening and a weekday afternoon, all studying the same material (ideally prepared by one of our members) at the same pace so that anyone having to miss their usual meeting can go to one of the others without missing or repeating any of it. We hold an ecumenical service, to which all the congregations are invited at Whitsun. These have included a full choral Anglican Evensong at St John's, and a jazz Service at Christ Church conducted (in both senses) by the Rev Ewan King, the minister at Heath St Baptist Church. We hold an informal picnic in July and an annual Quiz Night in the Autumn which has encouraged friendly rivalry and much fun while raising funds sums for the Camden Churches Cold Weather Shelter (C4WS). We don't meet often, but when we do, we share news of what's going on in our churches - what's going right, what's going wrong and our joys and sadness.